Homemade tortellini is one of the most important recipes of my hometown, Bologna! Along with Bolognese ragù and Lasagne, this recipe is an authentic icon of the Emilian culinary tradition. Here I’m telling you the history, the legend, and the traditional way to make tortellini. Not really easy to prepare, but a masterpiece of the Italian culture! Tortellini is one of those recipes for which Italian people are ready to argue years to call for their paternity! In this case, the dispute is between the people of Bologna and Modena. Following the myth, the Tortellini were created for the first time in an Inn located in Castelfranco Emilia, a village included into the Bologna county until the Fascist period, then passed under the Modena territory. This quarrel is still burning; every year Bologna and Modena organize a contest were 5 chefs from Modena and 5 chefs from Bologna compete for the best homemade tortellini! As the legend says, tortellini were created thanks to the creativity the publican of the Corona Inn in Castelfranco Emilia. One day, a group of nobles arrived at the Corona. They decided to break the trip and spend the night there. Waiting for the dinner, the nobles went up to their room to take a nap. The publican went up the upper floor. Peering through the slot of one of the doors he glimpsed the navel of the young daughter of one of the nobles. Fascinated by that sight, the publican went back to his kitchen and created a recipe inspired by the navel of the young Marquis: the tortellini! On XIX century, a famous short poem wrote by Giuseppe Ceri tell the story of tortellini in a slightly different way. The events and the location are the same of the former legend, but this time the protagonists are the Latin divinities Mars, Bacchus, and Venus. In this story, the Corona publican will be inspired by the goodness of beauty’ navel! The origin tortellini is ancient. Back in the XII Century, it was a tradition in Bologna serve filled fresh pasta for Christmas, named “Tortellorum ad Natale”. Originally, the filling was made with poor ingredients. Old pieces of cheese, tallow and what’s left of the meats used to prepare the stock. On 1570, Bartolomeo Scappi, chef of the Pope Pio V, wrote the first version of Tortellini recipe, close to the present recipe. Vincenzo Tanara describes in his book on 1664 “L’economia del cittadino in villa” tortellini cooked in a butter sauce, a famous recipe in those days, but currently fallen out of fashion. On 1904, the world met Tortellini! In that year the Bartagni brothers found a method to preserve Tortellini for long periods and presented them at the Los Angeles Fair. On December 7 of 1974, the “Confraternita del Tortellino” registered the official recipe of Tortellini at the Chamber of Commerce of Bologna. Pork loin, and Prosciutto di Parma, and Mortadella, and Parmigiano Reggiano, compose the traditional recipe for tortellini filling. On the contrary many persons think, the authentic Emilian Mortadella doesn’t contain any pistachios. Tortellini Bolognesi contain more cheese than their Modenesi cousins. The tortellini dough needs only eggs and flour, forget any oil or water! The dough is kneaded until elastic and consistent, then flatten until very thin. The right size of the dough squares for homemade tortellini is between 1 1/4 and 1 3/4 inches. Boiled into capon stock is the classic way to serve tortellini. If the capon is not available, a decent alternative is the beef and poultry stock. You won’t cook homemade tortellini into water. Otherwise, almost all the filling will loose his flavor! Even if internationally tortellini are prepared in many ways, Emilian people can tolerate only one recipe: cooked into meat stock. The day after, is common toss tortellini leftovers along with heavy cream and Parmigiano Reggiano. In the areas around Bologna and Modena, there are some traditional variations. In Romagna, Capelletti have a similar shape and size, but the filling is made with cheese and capon breast. They are tossed with meat sauce or served into Capon stock. In Marche, ground mixed meats and cheese compose the Capelletti filling. In Piacenza, Anolini is the typical recipe for Sunday gatherings and festivities. The filling is made with braised beef, pulled then mixed with Grana Padano and nutmeg. Originally, for the stuffing was traditional use poor meats cuts of pork and horse. Anolini are served into capon stock. Parma culinary tradition presents a poor version of Piacenza’s Anolini. In this case, the braised meat was reserved for nobles. The workers use to make the Anolini stuffing with bread crumbles poached into the meat sauce leftover. Homemade tortellini is one of the most important recipes of my hometown, Bologna! Along with Bolognese ragù and Lasagne, this recipe is an authentic icon of the Emilian culinary tradition. Here I'm telling you the history, the legend, and the traditional way to make tortellini. Not really easy to prepare, but a masterpiece of the Italian culture! Pour the butter into a pan along with 1 sprig of rosemary and 1 clove of garlic. 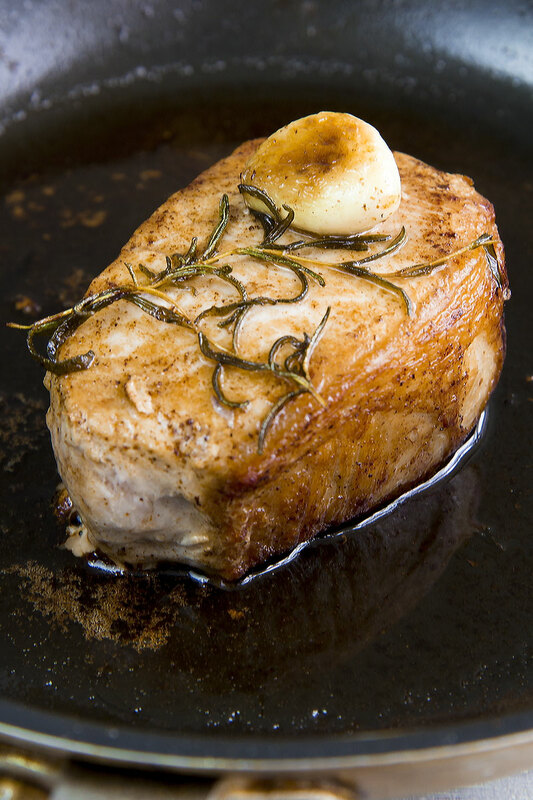 Melt the butter over medium heat and sear the pork loin a couple of minutes per side. Now, raise the flame and baste with 4 tbsp of white wine. Finally, reduce the flame a little bit and slow cook the meat until well done. Sift and save the sauce discarding the garlic and rosemary. Now, reduce the prosciutto and mortadella into pieces. 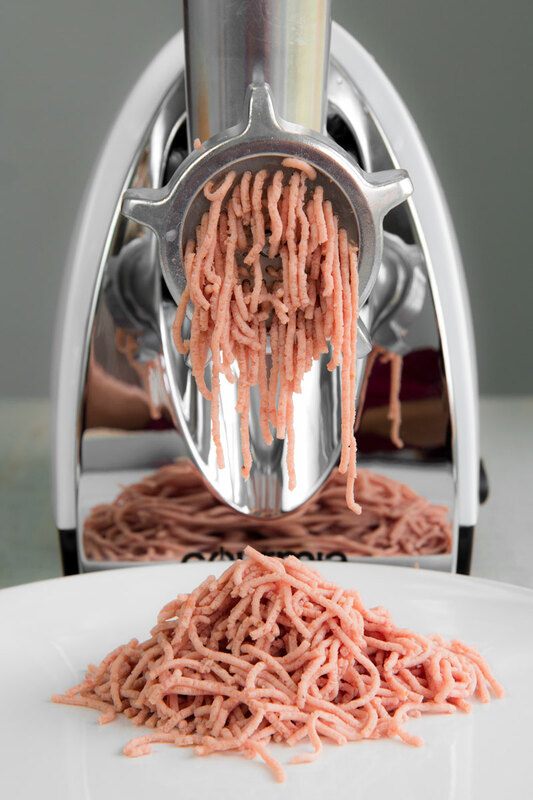 Reduce it into pieces as well, then grind along with the prosciutto and the mortadella. You want the mixture finely minced; if necessary, grind the meat twice. Eventually, add the grated Parmigiano Reggiano, and 1 egg, pork loin sauce, and a pinch of nutmeg. Knead the “pastino” until consistent, then pour in a covered bowl. Store in the fridge at least 5 hours up to 24 hours. Pour 255 g (2 cups) of all-purpose flour on a large board, best if wooden. 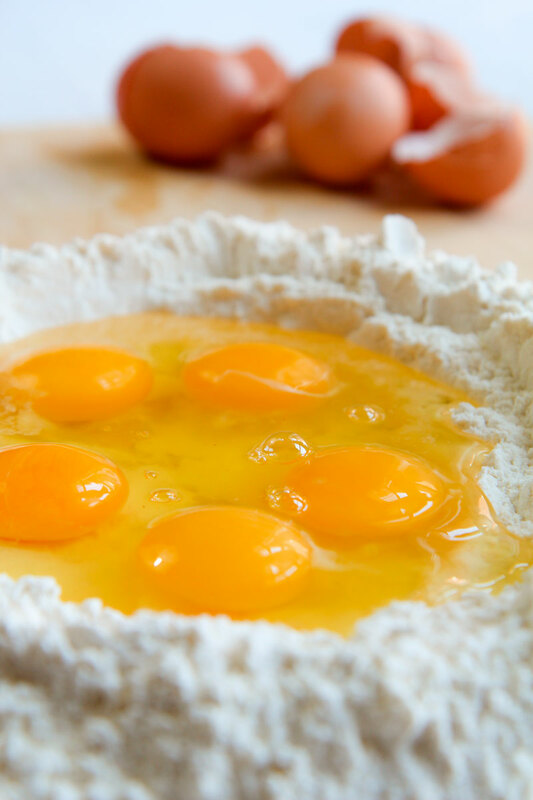 Shape a “volcano” with the flour, then crack 3 eggs and pour them into the hole created in the middle of the flour. 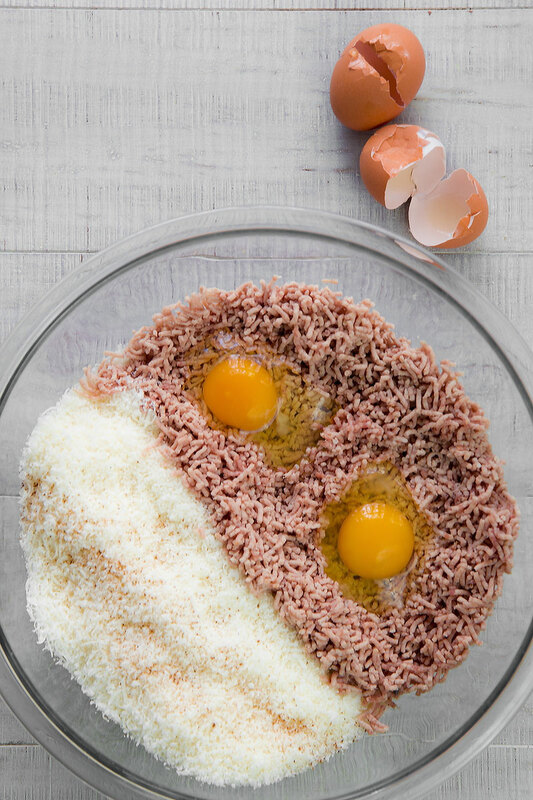 Now, beat the eggs lightly with a fork and incorporate the flour a little at time. Don’t break the edge of the volcano before the eggs mixture become dense enough. Knead the dough until obtaining a consistent mass. If the mixture results too moist, add a bit more of flour. 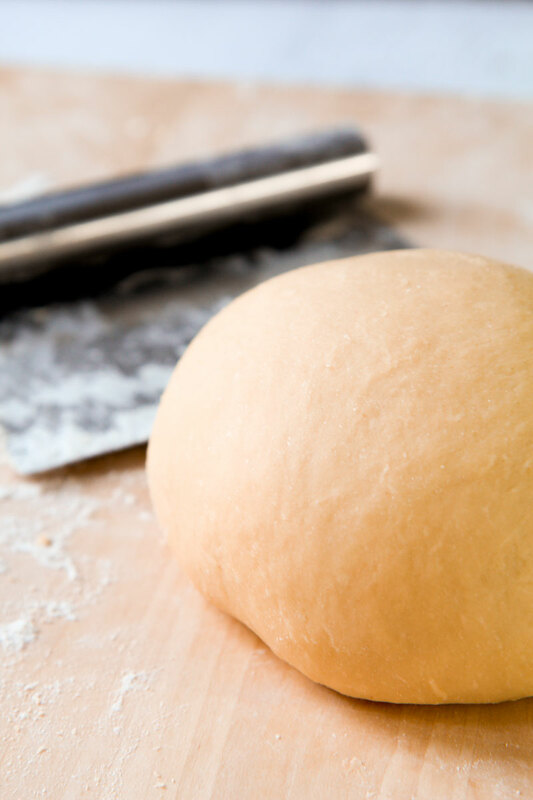 Continue to knead the dough at least 10 minutes with your hands or with a dough maker until obtaining a smooth and elastic ball, then wrap in plastic and place into a ceramic bowl. Store in the fridge at least 30 minutes before rolling. Dust the board and the rolling pin with a bit of flour, then place the dough. Beat lightly the dough, then roll into a very thin pasta layer. 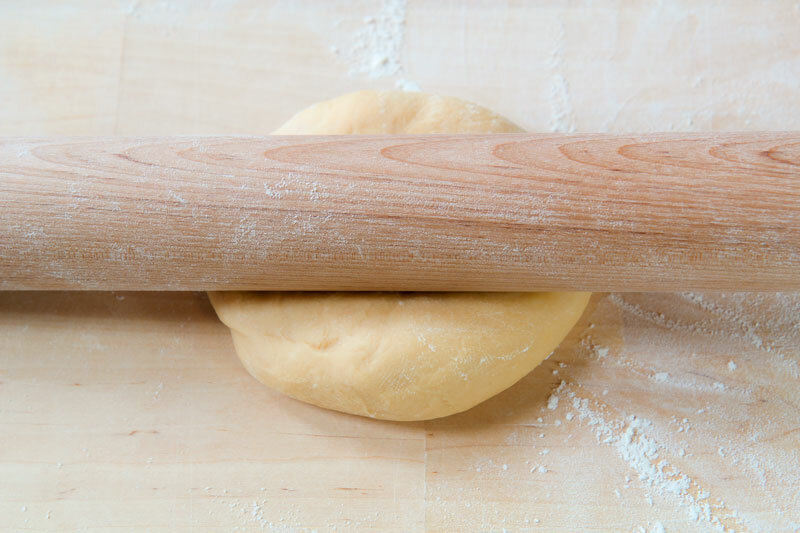 If you prefer, use a pasta maker instead of the rolling pin. Cut the sheets of dough into squares 11/4 inches by 11/4 inches. Place 1 pea of filling in the middle of each square, then fold the square into a triangle. 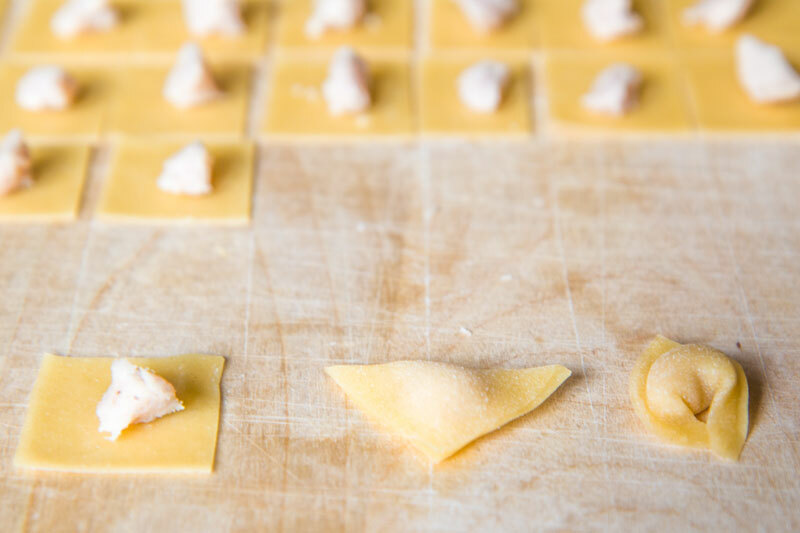 Finally, roll up the triangle and join the angles creating the typical shape of the tortellini. You want to work quickly otherwise the layer of pasta dries too much. To avoid this, roll small sheets of dough a little at time and spray a bit of water over the pasta every few minutes. To preserve homemade tortellini a few weeks, follow this method. 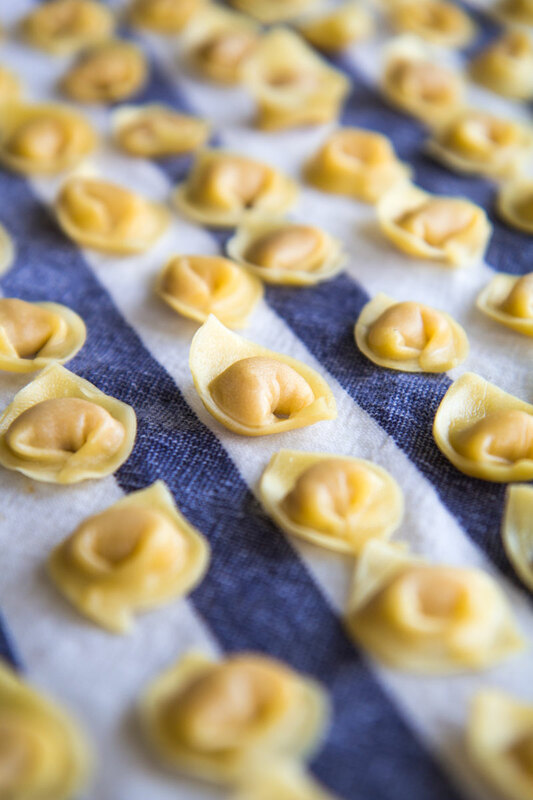 Once prepared, poach tortellini into boiling water just 8 to 10 seconds, a dozen at time; then raise and let them dry a few minutes over clean kitchen towels (this process is named sbianchitura). After that, place tortellini over a tray lined with parchment paper, so that they can’t touch themselves. Finally, place the tray into the freezer a few hours. Once frozen, is possible store tortellini in bags to save space in the freezer. Cook tortellini into boiling capon or beef and poultry stock. If frozen, do not unfreeze. The tortellini are ready when they raise to the surface. Serve very hot directly into the stock or raise and toss with heavy cream sauce. « HOMEMADE LIMONCELLO ITALIAN RECIPE AND HISTORY – ready in 3 days! Enjoyed the article as I just returned from your lovely city of Bologna! We did have the most amazing tortellini and I came home looking to recreate. Several times we had the tortellini with a light cream. Do you have the recipe for this or is it simply tossing the tortellini (cooked in meat broth) with cream and topping with Parmesan ( brought home some that was aged 35 years). I’m sorry for this late answer: I’m currently in Apulia, discovering new flavors and recipes to pubblish :-). I hope you enjoyed Bologna! 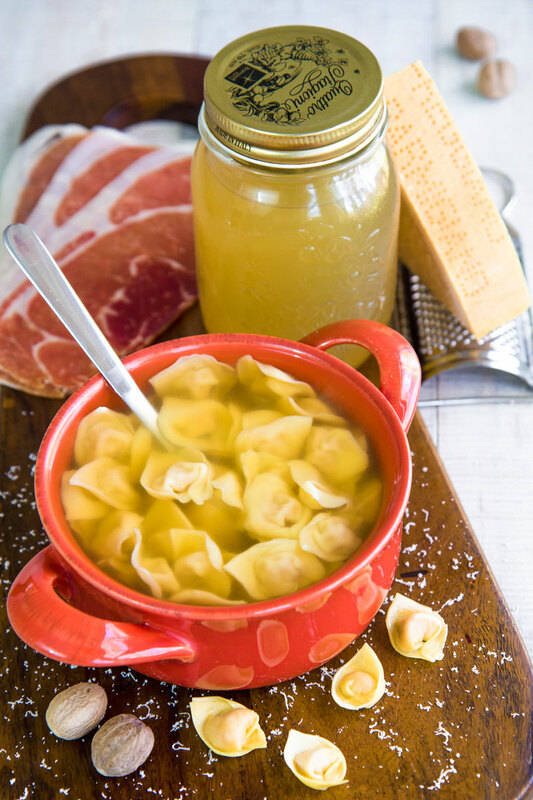 You need to know that the queen of the tortellini recipes is cooked and served into a meat broth. 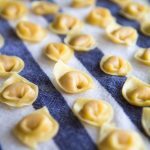 Traditionally tortellini with panna is a way to reuse the tortellini leftovers. Most of the local people undervalue tortellini with heavy cream, but you know what? I’m sure that they secretly love them (LOL)! If you want to prepare tortellini with heavy cream, just cook the tortellini a few minutes into the broth (the timing change depending if they are frozen, fresh, or dried). Raise tortellini “al dente”, then saute them along with a few tbsp of cream over low heat until the sauce become smooth but not watery. Complete with a sprinkle of Parmigiano Reggiano, then serve immediately. This is such a great and inspiring article. I have been obsessed with learning about making tortellini for the past month since I was in Bolognia with an upset tummy and the waiter suggested the Tortellini Brodo…he revealed to me that in Bolognia it is believed a good brodo can raise the dead. I now believe it as well. I loved your presentation and information and will happily follow you! Thank you. Thanks for your comment Nicholas! That’s true: the broth for tortellini is really a serious matter in Bologna LOL! Thank you for your interesting article about the history and legends surrounding tortellini in brodo. My wife is from Vignola and has been hand making tortellini every December since we got married in 1979. The filling she makes is virtually identical to the one you have given. She uses a whole chicken and beef shank for her stock. We do eat the left overs a la panna, usually the next day. Yesterday she made approximately a thousand tortellini and will ma another 7 or 8 hundred today. We and our children always look forward to our traditional Vignolese Christmas dinner. Thanks for your story John, and Merry Christmas! As a native of Bologna I keep alive the tradition of tortellini for Christmas, no matter where I am !! This year my daughter Stefania and granddaughter Sofia and I made them in Gualala, California!! I had brought the Parmesan (50 month) from Tamburini in Bologna. The Mortadella was so so but the risult was very pleasing Sofia has become very good at folding and closing them. The tradition continues!! preserving the traditions and donating them to the next generations is a wonderful job! I hope you’ll like them! 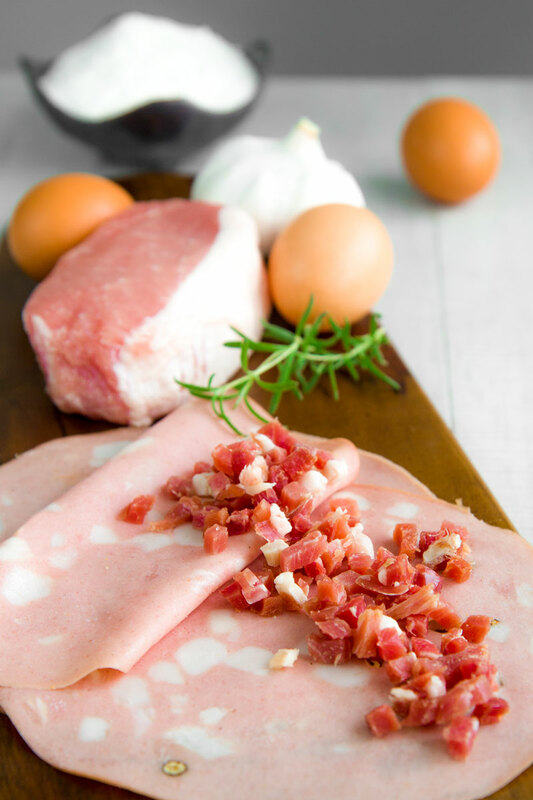 I had seen an “authentic” traditional recipe many years ago that i used that had no garlic and required bone marrow, cooked chicken and pork and mortadella all finely chopped together. I didn’t think much garlic is used in Emilia-Romagna! Well you are from there i guess you would know better. Hi Robert, thanks for your interesting comment! Commonly, when I write something about a traditional dish, I start from my family recipe confronting that with the most iconic local chef’s preparation, and historic cookbooks. I double checked the ingredients you wrote to me, but concerning the chicken and marrow bone, there is no trace in the main tortellini recipes. Actually, about the garlic and rosemary, this is a family variation (my granny and my mum used to add them), and I’m going to correct the post specifying this. My MIL was French on her father’s side and Italian on her mother’s. So while they were growing up my husband, his siblings and friends had the job of “folding” the tortellini that his mother and her friends made. This remains one of his fondest memories, though none of these wonderful women are still with us. My MIL had promised to teach me to make them but she passed before she could. I’m planning to use your recipe her to try and make them for him. Thank you for this terrific recipe, wish me luck.